'Three Identical Strangers': Nuanced Doc Tells A Gripping Tale — In Triplicate Filmmaker Tim Wardle reveals the fascinating story of three identical triplets who found one another by chance, and shows how the ensuing media circus, and long-buried secrets, took a toll on each. 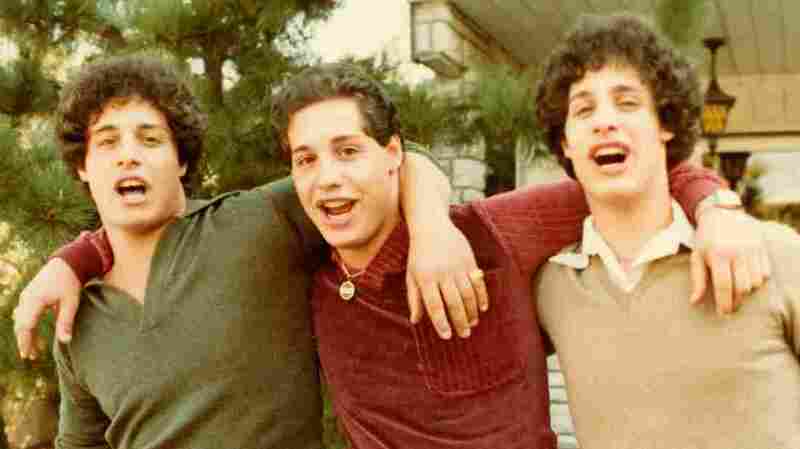 L to R: Eddy Galland, David Kellman and Bobby Shafran were identical triplets separated at birth; the documentary Three Identical Strangers explores their fascinating story. ... Stories. Now in his grizzled late fifties, Bobby Shafran is an affable, ordinary fellow whose life ran away from him back in 1980, when the nineteen-year-old freshman drove his beat-up Volvo to enter community college in upstate New York. He was puzzled at being effusively greeted by fellow students who called him Eddy. It quickly transpired that he was a dead ringer for another student at the college named Eddy Galland, who turned out to be the twin Bobby never knew he had. The discovery got into the local press, and soon a third lookalike, David Kellman, turned up. The identical triplets, all adopted by different families, were joyfully reunited and only too happy to take on the fairy-tale collective identity bestowed on them by the television talk shows. Which is when things began to really get weird, and not only because neither the boys nor their adoptive parents had known that other siblings existed. If Three Identical Strangers — an extraordinary documentary about the three brothers by British director Tim Wardle — were only about the deathless allure of identical offspring, it would still be a riveting tale. The demonstrable sameness of siblings hatched from the same egg excites the friction between our insistence on individual uniqueness and our desire for a mirror-image Other who will understand and defend us and keep us company forever. Or so the fantasy goes. It didn't hurt that the three boys, as we see in home movies and clips from the television talk circuit, were telegenic teddy bears with liquid brown eyes, masses of black curls and bashful, camera-ready grins. Paraded before an enthralled public, they dutifully showed up in the same outfits, crossed their legs in unison on demand, confessed under pressure to having the same taste in women. All had wrestled in high school, and wasn't it amazing that they all had adopted sisters? Bobby, Eddy, and David made the nightclub rounds, got married, opened a restaurant together. Their celebrity status was predicated on their sameness, and for so long as they could play along with the packaging, it was all so super-cute. Until it wasn't, and here the boys' story, or stories (the plural bursts with significance), went from amazing to incredible to very, very dark. On its face, Three Identical Strangers presents as a straight-ahead documentary with the usual mix of home and media footage, re-enactments, and testimony from friends, family, other interested parties as well as two of the siblings themselves. In fact, the film is an artfully constructed investigative narrative structured to give us the sense of discovering, along with the boys and their families, several layers of buried secrets and lies that blighted their adult lives. If ever a story called for multiple narratives and deep digging into the past it's this one. The triplets kept shedding identities and starting over in cataclysmic renewal — once at birth, again when they met and got swept into a media circus, and then, as new information peeled back their histories apart and together, in a reckoning that undid one of them and did serious damage to the others. From the moment they were born, the film shows, the adoptive families fell victim to casual abuses of power, from the adoption agency that concealed their biological parentage and their triplet status, to the scientists who used them as guinea pigs for a study of nature versus nurture that was never published, to the media that trapped them inside a fairy tale they could never live up to. Watching these families get gobbled up by skewed exposure to the public eye, I was reminded of Andrew Jarecki's equally riveting 2003 doc Capturing the Friedmans, in which an already troubled Long island family caught up in a child abuse case was further crucified by rushes to judgment on the part of the police, the courts, the media and their local community. Wardle captures the families' outrage at what had been kept from them. Sensitive to historical context too, he brings in journalist Lawrence Wright, who wrote a book about twin studies, as well as former researchers on the study, to show that ethical concerns about privacy and disclosure were less encoded into professional practice in the sixties than they are today. Still, interpreting the past through re-enactment can be tricky. The adoption agency is closed now and there's no one to verify the dramatized memory of one adoptive father who recalls stumbling on board members toasting one another with champagne after a meeting in which they thought they'd pacified angry parents with half-truths. In yet another twist to a serpentine tale that Wardle tracks like a thriller, we learn that the triplets had one more thing in common: All had troubled passages from childhood through adolescence, but its manifestations varied from boy to boy. All three grew up in Jewish families, but they spanned the class spectrum and their parenting styles varied, with one disciplinarian father taking the weight of blame for his son's emotional instability. When a former researcher reads from the notes he took during the testing, we learn as much about the heedless parent-blaming that prevailed among psychologists after World War II as about the boys' early difficulties. Once the movie gets deep into the muck of how vulnerable the triplets were to forces beyond their control, the differences between them become stark, and even the similarities don't tally up to the fable of happy similarity in which the media had wrapped them. Here the nature-nurture debate heats up and the movie's pendulum swings from heredity to environment as we witness the disparate fates that befell the three men. "It's all about nurture!" exclaims one relative. Not all, this nuanced film makes clear. And in one triplet's baffled, anguished cry about a lost brother, "Why him and not me? I don't know," a clue emerges that there is nature, and there is nurture, and beyond both lie the unknowable mysteries of human character: Who succumbs to trauma and who survives, and what survival even means when you've lost your flesh and blood many times over. Toward the end of Three Identical Strangers Wardle brings two brothers together to inspect new information about their past on a laptop. What they discover is disturbing enough, but what really breaks the viewer's heart is the nervous unease with which they greet each other, two identical strangers who were once close but seem not to have met in a while, and who seem to have lost the one thing that we assume twins should be able to count on. Trust.